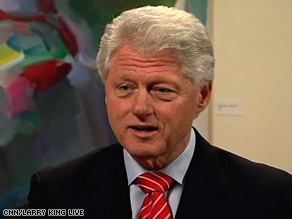 CNN’s Larry King talked with former President Bill Clinton on Tuesday night at the William Jefferson Clinton Center in Little Rock, Arkansas. In a wide-ranging interview, King talked with Clinton about the stimulus bill, the auto bailout, President Barack Obama’s BlackBerry, Chelsea Clinton’s future, Sarah Palin and more. The following transcript has been edited for brevity and clarity: Larry King: The stimulus bill passed today [Tuesday]. The president signed it in Denver. Is it going to work Bill Clinton: I think it will do what it’s designed to do. And I think it’s important that the American people understand what it’s designed to do. It’s supposed to do three things. Number one, put money in people’s pockets who are in trouble now — extended unemployment benefits, the modest tax cuts, increase in food stamps. That will help grocery stores and other businesses and keep Americans who are good, honest, hardworking people afloat. Watch Larry King’s interview with Bill Clinton » The second thing it’s supposed to do is give a chunk of money to state and local governments, primarily for education and health. That is designed to make sure that they don’t have to either have big tax increases or lay a million people off. Either one, in this economy, would be bad. The third thing it will do is to create jobs through existing road and bridge contracts, through rail improvements, through modernization and especially through clean energy and energy efficiency. So I think that given how fast it had to be done and the compromises that had to be made, it’s quite a good bill. And I think it will do what it’s designed to do. King: John McCain and others on the other side of the ledger are saying that he didn’t come forward enough to the Republicans, he didn’t make them part of this Easter basket. Clinton: Well, I disagree with that. I think the only way he could have gotten a lot of them to vote for him would be to accept their economic theory. Their economic theory is why we’re in this mess in the first place. King: Do you resent it when the Bush people say that this problem started with you, it started in your administration Clinton: Well, they don’t have much evidence for that. I always answer, does anyone seriously believe if the team I had in place had been in place for the last eight years that this would have happened And the answer to that is no. We had a much more vigorous regulatory environment with the Securities and Exchange Commission. We were watching these derivatives. I do think we should have done more on derivatives. King: Before we move on to other things, should taxpayers be bailing out the automakers Clinton: We don’t owe it to them. We should only do it if it’s in our interests. I believe it’s in our interests … King: We keep hearing about Obama’s BlackBerry — he’s got a special BlackBerry now that doesn’t have to be recorded into the White House. Do you have the number Clinton: No. No. King: Would you like the number Clinton: I know that in the world that exists today, if you’re hyper-busy, you need them. Hillary lives on hers. King: Do you have one Clinton: I don’t. I like being able to concentrate on what I’m doing one thing at a time, you know. And I think if I had one, I’m so hyper and always trying to do three things at once, I’d be worse than he is or worse than she is. So I don’t have one. King: What’s Chelsea going to be Is she interested in government Clinton: Yes, she’s interested in government. She cares about public health. She thinks that America has still got a ways to go to develop an affordable, high quality health care system. And I think she wants to be a part of it. King: Sarah Palin, net plus, net gain Clinton: I think she was a net plus before the failure of Lehman Brothers and the collapse of the stock market, because she gave (McCain) credibility on the Republican right. Through no fault of her own, she became a negative on September 15th, because nobody on their team had any economic experience, and the burden against the Republicans was overwhelming. King: What do you make of President Obama I mean, for a while I know that you were down and dirty tough when Hillary was running. And that was a pretty rough campaign, a very close campaign. What do you make of him now Clinton: Well, I always had a great respect for his abilities. Those have been confirmed by the way he’s conducted himself in the transition and in these early weeks. I think he is very smart. And I think he wants right things for America. And I think he’s made good people decisions and good policy decisions. King: Can he try to live like a normal person — going home to Chicago, kids go to school, he helps take them to school, plays basketball, goes out to public restaurants Can you keep that up Clinton: I think so. I did quite a bit of it and I wish I had done even more. King: What would you recommend or say or advise George W. Bush about being a former president There aren’t many of you. Clinton: Well, first I would advise him to make his own decisions with Laura about how they want to spend both the next five years and then the rest of his life. You have to assume he’ll live 20 to 25 more years, and he seems to be in very good health. And I think he should just look at this as a whole new phase of his life. King: You opened the second Clinton Global Initiative University conference this past weekend and also a thousand students attended. How do you see the younger generation responding the global challenges, especially in these economic times Clinton: There is a very large number of them who are doing astonishing things. For example, one young woman decided that she’s going to go around and collect all the kitchen grease from all the dining halls and then nearby eateries and then use it to make biodiesels, to run cars and lawn mowers and generators. King: For all the years we’ve known each other, it never gets dull. Clinton: Thank you.